The strategy of previewing sitcoms behind THE VOICE continues to work for NBC. NBC: THE VOICE fell 0.4 from last Tuesday to 2.7, but that was still enough to give CROWDED a solid 1.8 start for its first half-hour, although the show fell to 1.4 by 10:30PM. Now that LITTLE BIG SHOTS is established as a strong performer on Sundays, CROWDED should continue to get the benefit of a helpful lead-in on its regular night. ABC: A night that was problematic is becoming a disaster area. FRESH OFF THE BOAT dropped 0.3 to 1.1, THE REAL O’NEALS lost 0.1 to 1.0, AGENTS OF SHIELD fell 0.1 to 1.0, and OF KINGS AND PROPHETS may have had its last network airing after a 0.3 collapse to 0.5. 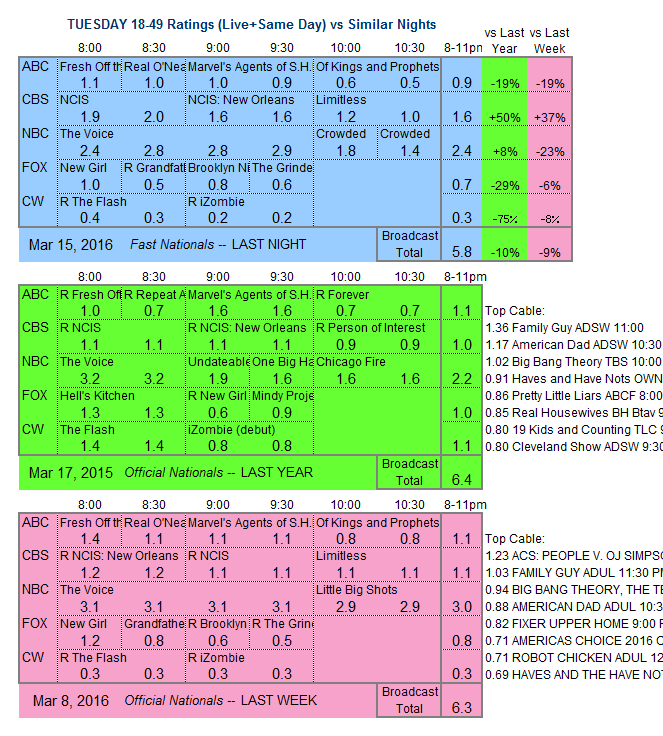 CBS: Returning from a week off, NCIS and NCIS: NEW ORLEANS were both steady at 2.0/1.6. LIMITLESS held at last week’s 1.1. 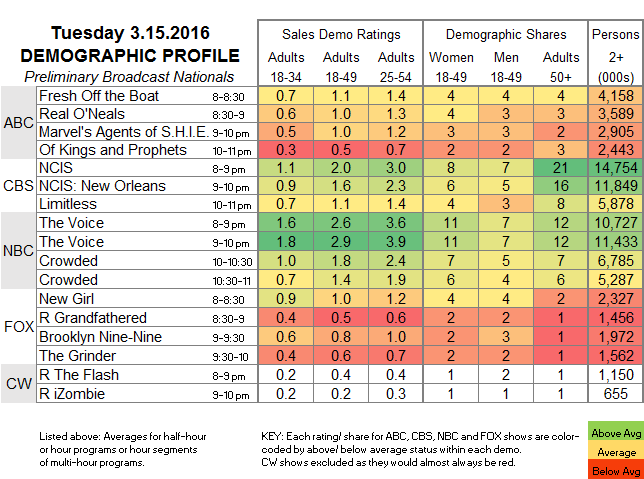 FOX: NEW GIRL dropped 0.2 to 1.0, then (presumably for production reasons) GRANDFATHERED aired a 0.5 rerun. BROOKLYN NINE-NINE and THE GRINDER remained at their numbers from their last original airings 2 weeks ago at 0.8/0.6. The midseason wave continues tonight, as CBS introduces the spin-off CRIMINAL MINDS: BEYOND BORDERS and ABC’s NASHVILLE returns after its winter hiatus. On cable, FX’s brilliant but eternally under-watched THE AMERICANS has its season premiere, and TV Land’s TEACHERS shuts its doors.